The University Galleries at Florida Atlantic University’s Dorothy F. Schmidt College of Arts and Letters will present “Home Mask Relations: A Social Art Project by Isabel Berglund.” This participatory art project explores the social spaces of “togetherness,” “relationships” and “home.” The exhibition will be on view from Saturday, Nov. 4 through Saturday, Jan. 20, 2018 in the Schmidt Center Gallery, 777 Glades Road, Boca Raton campus. There will be an opening reception on Friday, Nov. 3 from 6 to 7:30 p.m. The exhibition and opening are free and open to the public. “Home Mask Relations: A Social Art Project by Isabel Berglund” draws meaningful, individual connections through knitting, a popular craft that can show ways in which domestic space has been claimed and delineated in the United States. This is an important conversation for an American audience as issues of rural decline, urban sprawl and the history of land appropriation continues to evolve. 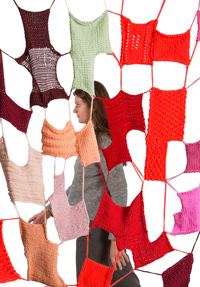 Berglund’s immersive, large-scale installation will consist of individual hand-knitted panels – made by hundreds of individuals from three American cities – joined together with threads. The artist’s intent is to break down socioeconomic and political divisions or barriers and, in turn, build relationships between people of different backgrounds using the practice of knitting as a guide. The completed installation represents a cross-section of the United States through knitted floor plans unique to each area and created by the artist and community participants. Berglund and the “Knitting Together” workshops have enlisted the help of some 400 participants ages 8 through 95 throughout the United States and will grow to more than 600 after the current “Knit and Stich” workshops in South Florida (Oct. 16 – 27). Berglund has achieved this community outreach and involvement through three university residencies in Phoenix, Arizona (Arizona State University); Bloomington, Indiana (Indiana University) and Boca Raton (FAU). The collective patches will be sewn together in a massive collage through the hands of the artist into the “Home Mask Relations” installation. Berglund’s installations have been exhibited in various venues worldwide including Collect 2017, London; Seoul Arts Center, Korea; Jean Lurcat & Tapestry Museum, France; Museo Poldi Pezzoli, Milan; and Museum Bellerive, Zurich. Her work has been featured in numerous publications. Berglund’s most recent project “Monument of Stitches” enlisted the help of more than 650 residents from six cities on the Danish Peninsula Jutland. Each city was represented by a local architectural element or monument constructed from hand knitted triangles; the completed cityscape was exhibited at the Trapholt Museum of Modern Art, Denmark in 2016. All exhibitions in FAU’s galleries are free and open to the public, Tuesdays through Fridays from 1 to 4 p.m. and Saturdays from 1 to 5 p.m. School and group tours can be arranged via appointment during public hours or alternative times by e-mailing (knuruddin@fau.edu) or calling the University Galleries at 561-297-2661; or visiting www.fau.edu/galleries. The Schmidt Gallery is in FAU’s Performing Arts Building, while the Ritter Art Gallery is adjacent to FAU’s Wimberly Library on the second floor of the University Breezeway. The “Home Mask Relations – A Social Art Project by Isabel Berglund” exhibition and programs have been made possible in part by the State of Florida Division of Cultural Affairs and Council on the Arts; Cultural Council of Palm Beach County; R.A. Ritter Foundation; and Isadore and Kelly Friedman University Galleries Fund. Museum Education Programs are made possible by Kaye Arts Integration Endowment and Community Foundation of Palm Beach and Martin Counties.